Inter-procedural analyses such as side-effect analysis can provide information useful for performing aggressive optimizations. 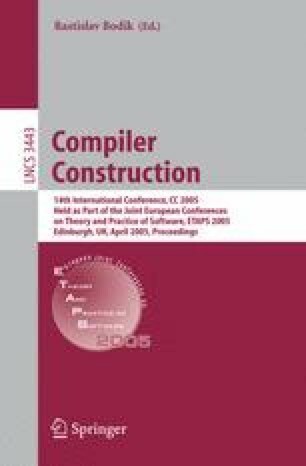 We present a study of whether side-effect information improves performance in just-in-time (JIT) compilers, and if so, what level of analysis precision is needed. We used Spark, the inter-procedural analysis component of the Soot Java analysis and optimization framework, to compute side-effect information and encode it in class files. We modified Jikes RVM, a research JIT, to make use of side-effect analysis in local common sub-expression elimination, heap SSA, redundant load elimination and loop-invariant code motion. On the SpecJVM98 benchmarks, we measured the static number of memory operations removed, the dynamic counts of memory reads eliminated, and the execution time. Our results show that the use of side-effect analysis increases the number of static opportunities for load elimination by up to 98%, and reduces dynamic field read instructions by up to 27%. Side-effect information enabled speedups in the range of 1.08x to 1.20x for some benchmarks. Finally, among the different levels of precision of side-effect information, a simple side-effect analysis is usually sufficient to obtain most of these speedups. This work was supported, in part, by NSERC and FQRNT. This version was published online in June 2005. Ondřej Lhoták’s surname had been written incorrectly in the original online version.